At South By Southwest in March, Google[x]’s “Captain of Moonshots” told an audience that Elon Musk is a “national treasure.” Musk’s brilliance doesn’t come from being the world’s smartest man, said Astro Teller, who is responsible for overseeing Google’s think-big projects such as self-driving cars and high-altitude wifi balloons, but it’s that he has the bravery and creativity to try things that others might regard as just a little bit crazy. And he's put nearly $200 million of his own money into them. That spirit was again on display today when Musk announced the details of his “Hyperloop” idea, a set of designs for a transport system so fast that it could transport a passenger from San Francisco to Los Angeles in just 30 minutes. It would also cost about 10 percent as much as the California High-Speed Rail project, which will take decades to build and will cost about $68 billion. Musk doesn’t plan to build the Hyperloop – he’s too busy with Tesla Motors, his electric car company, and SpaceX, his rocketship company, for that. Instead, he’s open-sourcing the plans and hoping that someone else takes on the project. It’s a bummer that Musk doesn’t intend to make the Hyperloop a reality, but when it comes to cementing his place as a world-changing visionary – one of the few people who truly deserve the label – that doesn’t matter all that much. What’s more important is that he is stoking the public imagination for what can be achieved with audacious and unconventional thinking. And he’s doing it without any of the blowhard bombast of other innovators of his generation. It’s difficult to understate just how important Musk’s unconventional thinking is. While much of the tech industry froths over frivolities such as Snapchat, Instagram, Facebook, or whatever consumer app of the moment is grabbing an eye-popping valuation, Musk continues to raise the bar – not just in terms of what can be achieved, but in terms of what can be imagined. Through genuine thought leadership, he leads us to ask more of ourselves. At the recent D11 conference, he even made the point explicit, pleading with successful entrepreneurs to think outside the Internet. “I recommend that people consider arenas outside of the Internet, because there’s a lot of industries that could use that entrepreneurial talent and the skills that people have learned in creating those companies,” he said. 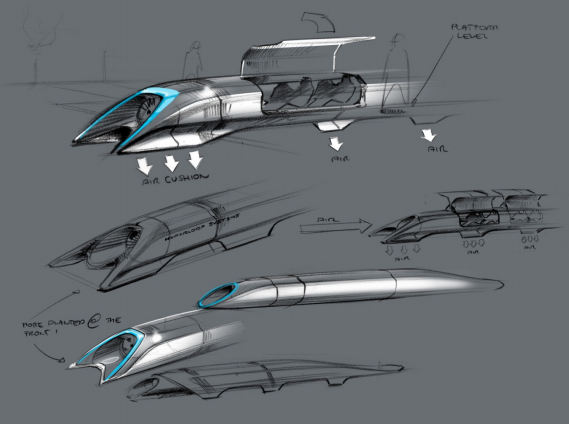 A concept sketch of the Hyperloop published in Elon Musk's plans. This way of thinking not only spurs other entrepreneurs and innovators to aspire to a higher plane of achievement, but it also has a flow-on effect in inspiring future generations of innovators. Musk, who studied physics, is making science cool again to the extent that he even has a Hollywood movie character, Tony Stark of "Iron Man," modeled after him. He’s a mad scientist in a muscle T.
Until now, the media’s preeminent tech hero of the decade has been Steve Jobs, who rightfully deserves credit for reinventing several industries, including entertainment, computer hardware, and telephony (to name a few). But Steve Jobs’ legacy, while important and impressive, will always be confined to business, tech, entertainment, and retail. While Jobs’ achievements came in the fields of design, consumer experience, and software platforms, Musk’s contributions to the world will ultimately be measured in light years. PayPal introduced a new way transmit money. Elon Musk was one of the founders. SolarCity is a solar company that brings cheaper and cleaner electricity to people’s homes. Elon Musk came up with the idea and funded it. Tesla Motors produces electric cars that people want to buy, triggering an industry-wide rush to build cars that don’t burn fossil fuels. Many using his batteries. That was Elon Musk. SpaceX is a private space company that can send rocketships to Mars and has produced spacecraft that can take off and land vertically. That was Elon Musk. And at 42, he’s just getting started. Musk has his flaws. When the New York Times published a critical review of the Tesla Model S, he reacted with a thin-skinned attack on the author’s credibility. His marital difficulties and other personal problems have been very publicly raked over. And there will be, no doubt, more things to come that will cause us to question his hero status. But for now we ought to salute Musk’s wanton disregard for convention. More importantly, we should learn from it. Musk is, indeed, a walking moonshot. He is the sort of visionary that we should not just follow, but also emulate. The one thing he’s not, thankfully, is a superhero. Elon Musk is no Tony Stark. But he is something much better than that: He’s real.